The federal government is investing in Hitachi Construction Truck Manufacturing to help the company expand its Guelph plant, increasing production capacity and creating 244 new jobs. Click here to learn more. A Statistics Canada report says that while operating profits for Canadian corporations were unchanged in the first quarter of 2012, manufacturing profits decreased 16.2 per cent. Learn more. Auto parts producer Timken Co. says it is closing a plant in St. Thomas, Ont. in about a year, which will result in job losses for some 150 active employees. Find out more. ATS Automation Tooling Systems Inc. swung to a profit in its fiscal 2012 fourth quarter as revenues from continuing operations rose 17 per cent. Get the details. The Control System Integrators Association (CSIA) has named Software Toolbox its Partner of the Year. The award recognizes the company for significant contributions to the advancement of the CSIA and its members. Read more. Industrial manufacturer Eaton Corporation and electrical equipment supplier Cooper Industries plc announced they have entered into a definitive agreement under which Eaton will acquire Cooper. Click here for more details. CVG-Avtec knew that it needed a Product Lifecycle Management (PLM) system to meet its goals. Designed to manage detailed engineering information, a PLM system would allow CVG-Avtec to clearly see and understand what the actual changes are from one product revision to the next, as well as implement staged workflows for review and approval on all changes to ensure accuracy, accountability and create structured processes. Learn how they did it here. We sit down with our editorial advisory board for our sixth annual roundtable discussion to talk about trends and challenges in the Canadian manufacturing industry. Find out what our group of experts has to say. Circular connectors are used in many automation technology applications, such as sensor signal transmission and low power supply, or for data communication in fieldbus technology. There are many connector formats available for the signals, power and data needs of these applications. This article guides you through the options available. Installing a thread protector onto exposed threaded pipe on oil tools is a difficult and time-consuming job. But London, Ont.-based JMP Engineering found a way around this challenge by working with an oil industry manufacturer to develop a flexible automation process that uses two robots guided by machine vision to process a wide range of parts. We take a look at the solution. Professional engineer Franco Tomei will evaluate the incentive to defeat safeguards. Find out who he says is responsible when operators defeat safeguards, and how to prevent this from happening. 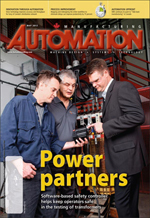 Plus: News and trends, as well as a selection of the latest software offerings, hydraulics and pneumatics products, HMI offerings, robotics equipment, sensors, motors and drives, as well as test and measurement products. June 3: CAF-FCA 2012 Conference - Regina, Sask. June 4: ISA's 58th International Instrumentation Symposium - San Diego, Calif.
June 5: PROFINET One-Day Training Class - Montreal, Que. June 6: Sensors Expo and Conference 2012 - Rosemont, Ill.